1. TIPS FOR IMPROVING THE LEFT-HAND. 2. Humor: WHY A DOG IS BETTER THAN A SPOUSE . . .
up to par with the STRONG-HAND? the left-hand and vice versa. ���� I'll TRY to give you some 'quick clues' here. or 2 or 3 pages for that matter. ���� #1.� Throw that practice-pad back in the drawer . . .
�������� * What's the MOST DIRECT PATH? ALONG WITH 'REAL' RECORDED MUSIC. already have drums.) <--- This is REALLY step #1. ���� SOUND is the MOST IMPORTANT 'MAGIC' INGREDIENT. 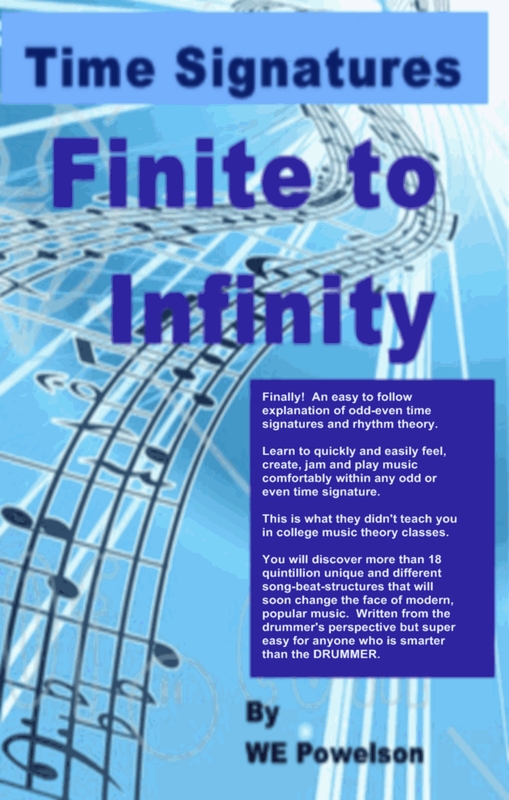 ���� #4.� Begin JAMMING with recorded music EVERY DAY! NOW, THE REAL ANSWER . . .
10-LESSONS on THAT too, (and why), later in the course. BACK TO THE LEFT-HAND . . .
may do the most for you to develop your bad or weak hand. MORE EFFECTIVE lessons at the MEMBER site. be headed for absolute boredom and possible failure. be boring, difficult or ANYTHING LIKE WORK. ���� EVERYTHING ELSE WILL COME NATURAL! the most equal-development in ALL limbs? a practice-pad 30-minutes per day. ���� 'b.' is the CORRECT answer. had not discovered the FUN, themselves! ���� There's really no excuse for such boredom! ���� WHICH WOULD BE BETTER? ���� WHICH WOULD YOU CHOOSE? and easily, as they'll be shown in the lessons, below. ���  RUDIMENTS . 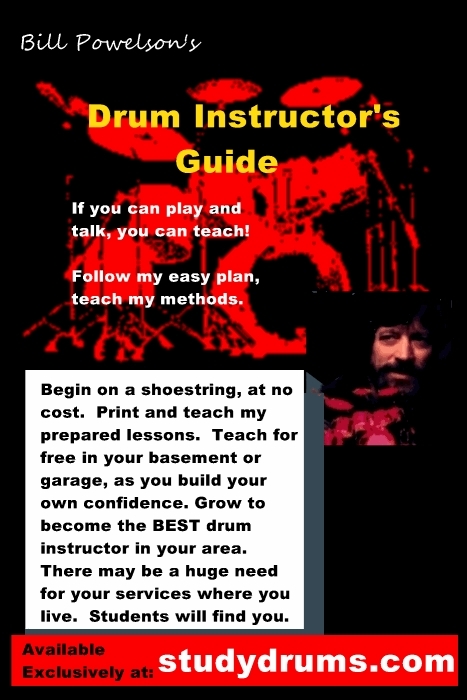 . .
apply and USE the primary rudiments, FIRST! ��� The KEYWORD here is "USE" and/or "PLAY". ���� DO YOU USE THEM REGULARLY ON YOUR GIGS, OR AS YOU JAM? FROM THESE SIMPLE 'NOTE VALUE FILLS', BELOW . . . Using Whole Measure Rudiments and Rolls. to DO SOME VERY SERIOUS THINKING! 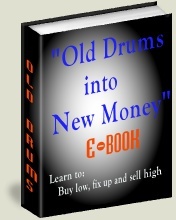 WHAT ABOUT THE RUDIMENT CHARTS? 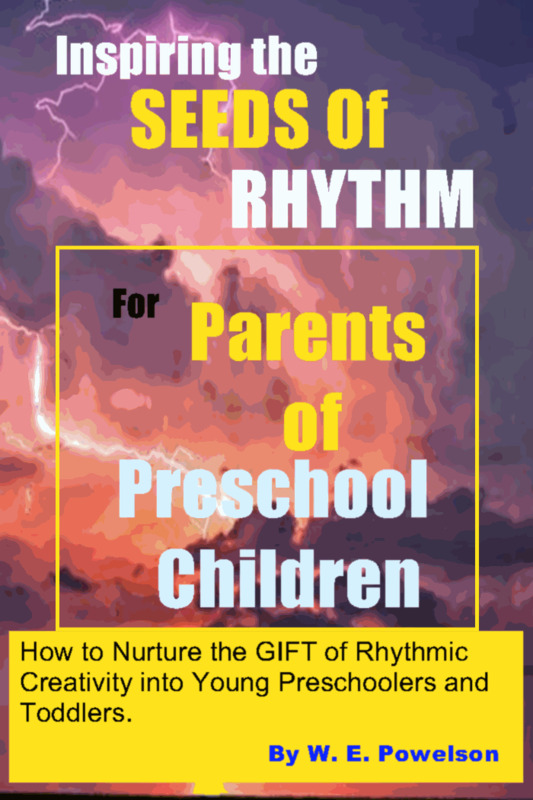 ��� THEN (and only then), visit the rudiment charts! devote about 1-hour towards some necessary 'boring' effort. are totally prepared for them. at the beginning of, 'Rudiments, Rolls and Fills, PART I'. the MOST USEFUL AND MOST IMPORTANT RUDIMENTS, FIRST. �� Forget that masochistic, self-destruct notion! need me, if being bored is the thing that thrills you. others will be a snap, later! HAVEN'T really learned them at all, yet! busy for several thousand years! (NOTE:� AS A GENERAL RULE . . .
may best be used AS FILLS with Blues, Shuffle, Swing or Waltz. used AS FILLS with 16th 4/4, 8th 4/4, or Quarter 4/4. ��� Think about that a long time. bad-hand tremendously too! More on that in another issue. ���� See ya next month! WHY A DOG IS BETTER THAN A SPOUSE . . .
1.�� The later you are, the more excited they are to see you. 2.�� Dogs will forgive you for playing with other dogs. 3.�� If a dog is gorgeous, other dogs don't hate it. 4.�� Dogs don't notice if you call them by another dog's name. 5.�� A dog's disposition stays the same all month long. 6.�� Dogs like it if you leave a lot of things on the floor. 7.�� A dog's parents never visit. 8.�� Dogs do not hate their bodies. than in your wallet or desk. 11.�� Dogs seldom outlive you. 13.�� Dogs enjoy petting in public. 15.�� Dogs find you amusing when you're drunk. 16.�� Dogs like to go hunting. 17.�� Another man (or woman) will seldom steal your dog. happily play with both of you. "If I died would you get another dog?" in your hotel room for F*r*e*e.
paper and give them away. without calling you a pervert. 23.�� A dog won't hold out on you to get a new car. get mad, they just think it's interesting. the heater or air conditioner. 26.�� Dogs don't let magazine articles guide their lives. 27.�� When your dog gets old, you can have it put to sleep. 28.�� Dogs like to ride in the back of a pickup truck. 29.�� Dogs are not allowed in Bloomingdales or Neiman-Marcus. 30.�� If a dog leaves, it won't take half your stuff. Special thanks to Dianne Conner for this one . . .